Texas Instruments Sitara AM335x processor are designed by industrial applications, and found in develompent board such as BeagleBone Black or BeagleBone Green, and the company has recently launched the new Sitara AM3351 Cortex A8 processor without 3D GPU, no PRU just like AM3352, but they’ve also canned the two CAN interfaces (sorry, I had to) in order to bring the cost lower, while keeping the processor software and pin-to-pin compatible with other AM335x processors available in 13×13 mm package. TI Sitara AM3351 CPU clock will also be limited to 300 MHz to 600 MHz with respectively AM3351BZCE30 and AM3351BZCE60 parts. 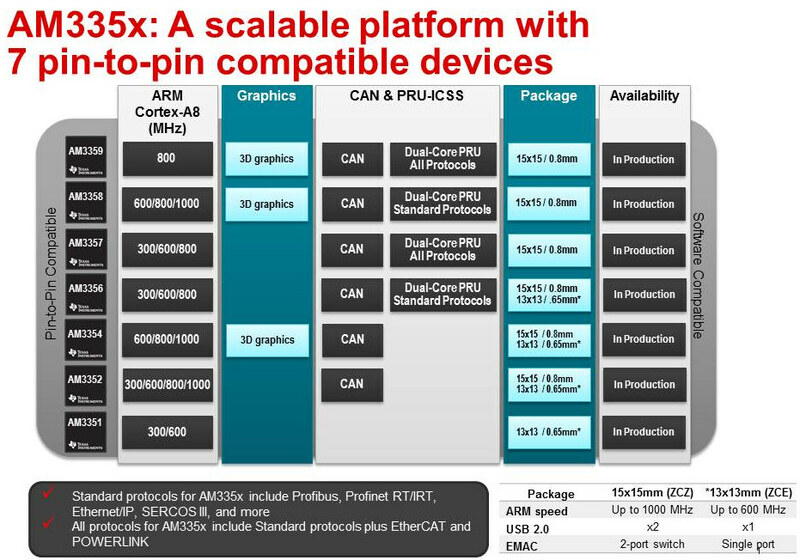 It will only come with one Gigabit Ethernet port instead of up to two ports of other members of the family that are produced in 15x15mm package, and temperature range is limited to 0 to 90 C. Other features remain the same, and the processors will support TI-RTOS, Linux, Android, and Windows Embedded CE like its big brothers. Texas Instruments Sitara AM3351 processor is available now with pricing starting at $5.70 in 1k quantity. More details can be found in the product page.